One of the questions our RE asked us on our first appointment was whether we wanted to do a genetic screening test. He said some people feel strongly that they want it done, whereas others opt out. 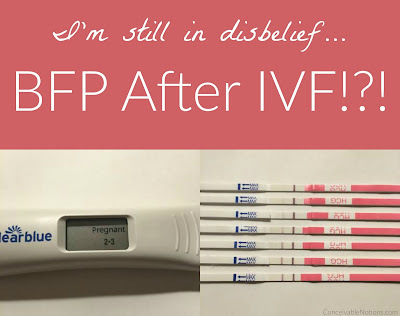 At that time we chose to opt out, but decided we would have the testing done if we were thinking of moving forward to IVF. Well that time has come. Even though we still have one more IUI to do (for a grand total of 6! ), we wanted to prepare in case it doesn't work out. 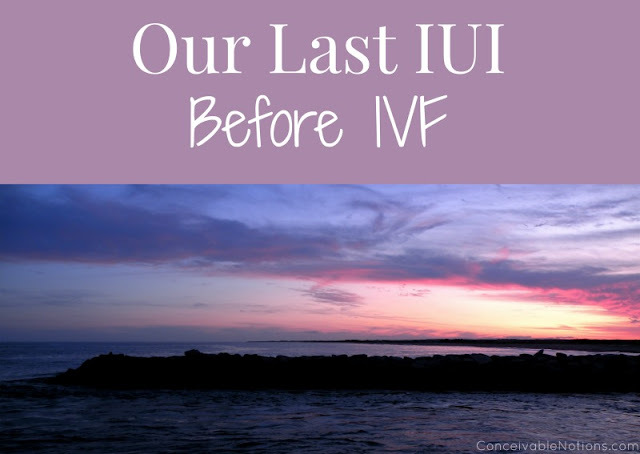 And let's face it... we've had 5 IUIs so far, and only got a positive beta on one of them, which ended in an early loss... so we aren't getting our hopes up super high that the last IUI will work. If it does, we will be over the moon! And it would be an amazing surprise. But I would rather get used to the idea of it not working and be in disbelief if it does, than getting my hopes up so high and to be crushed if it's a BFN. 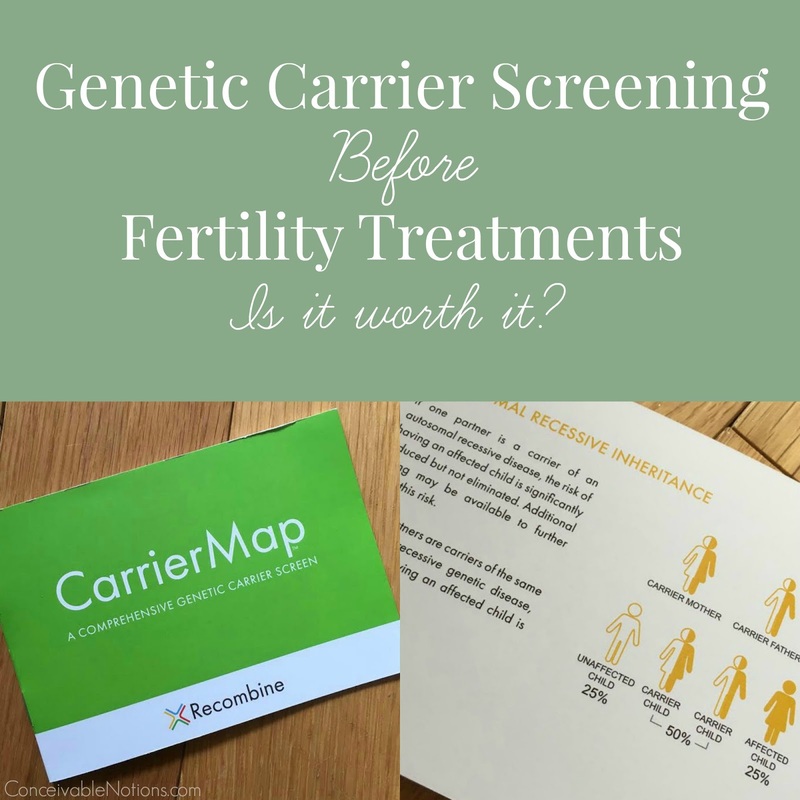 Our first step in the "prep for IVF" process is the genetic carrier screening. Previously, our RE's office used the Counsyl screening test, but just recently switched to the Recombine CarrierMap screening test because the cost was lower for patients. The CarrierMap test also tests for more genetic conditions than the Counsyl test does. Carriermap tests for over 250, while Counsyl tests for over 100. So cheaper and tests for more things? Sign me up! I want to get my money's worth. Speaking of money, I was absolutely thrilled when I heard back from the billing department of Recombine. It turns out, my price for the test is only $95! That's significantly cheaper than the price I had gotten from my RE's office for Counsyl testing. So why did we change our mind about the testing? Originally we were hoping that it was only a mild sperm issue. Both doctors we saw thought an IUI would easily fix the problem. But going on 6 IUIs now, and no lasting pregnancy. IVF is expensive and we don't want to waste a cycle without having all the information available to us. If it turns out both myself and my husband are carriers of the same genetic issue, we can do PGD testing to ensure our embryos did not get the condition and only healthy embryos will be transferred. The test itself was really simple. I just had to fill out a short form and had a small vial of blood drawn at our clinic. The blood is overnighted to them by FedEx, in a plastic bag type box. 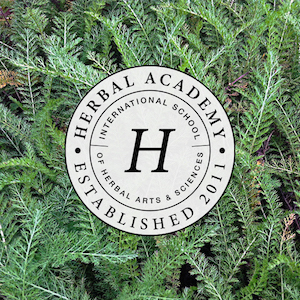 Results should be ready in 1-2 weeks. If I test positive for any genetic issues, then my husband will be tested for those things as well. As long as both you and your partner are not carriers for the same thing, there is nothing to be concerned about. So what are some of the benefits of testing? Reassurance that you aren't a carrier for a major genetic issue. If you and your partner are both carrier of the same issue, you can plan for this with your doctor. Making the right decision ahead of time. If you are considering embarking on expensive fertility treatments, having the test results can impact your treatment. In some cases, IVF may be the best option for genetic issues because they can test the embryos before transferring them. Going through months of IUI only to find out later, IVF was your best option, can be a difficult thing to deal with. Can plan ahead for future testing during pregnancy. If you aren't planning to do IVF but still have a genetic concern, testing can be done early in your pregnancy on your baby to ensure they are healthy. Knowing this ahead of time can help you make the right decisions for your little one. More information is always better. Even if both you and your husband are carriers of the same thing, there is only a 25% chance your child will be affected. Knowing this will help you to make informed decisions down the road. For me, just knowing we did all the testing available to us is a comfort. There comes a point when you've done all you can. I like not leaving any stone unturned. I'll do another update when I get my results. Fingers crossed it comes back with no issues! Well, here we are again. 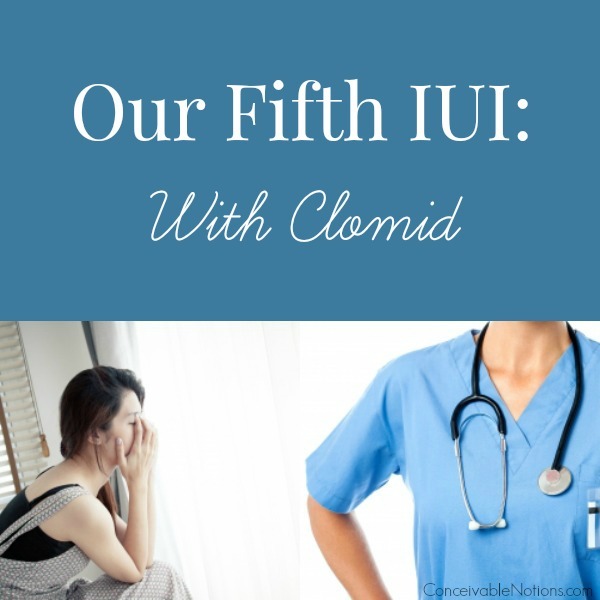 Our fifth IUI. At least for me, my feelings about what we're going through seem to shift and change with each cycle. Sometimes I am full of hope and sure things will be just fine, other times I have more questions lingering in my mind, and sometimes I am just downright sad or overwhelmed. This month, I'm feeling sick of all of this. I know many people read these types of blogs for hope and inspiration, but I really do want to be real here. Infertility is hard. Not having a baby when you desperately want one is hard. Taking fertility medications is hard. Getting poked and stabbed is hard. And then it's also hard once you see the bill and realize you're paying to get prodded with ultrasound wands and tubes slipped inside of you.. and you still don't have the baby you've been hoping for after years. But I think most of us who go through any fertility issues at all are familiar with the ups and downs. You can't predict what might happen or what may be in store next month. At times, you will be bursting with hope! But sometimes, you will be full of despair. And that's okay. Again this month we are doing 100 mg of Clomid, CD 3-7. I am very used to taking the Clomid now. At first, I really had a lot of anxiety about it, but that is gone now. I even used to hate the taste of the pill! But I must have gotten used to that as well. Thankfully, I'm still doing really well and have only had a couple of hot flashes here and there. I am to start OPKs on CD 10, as usual. 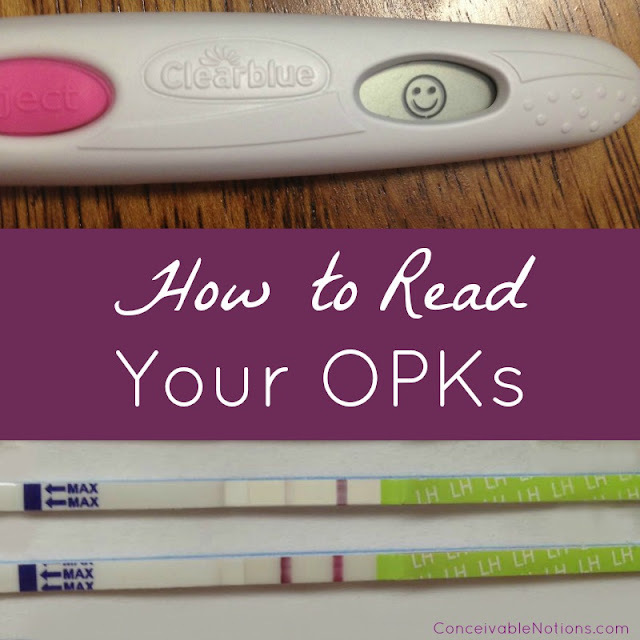 I got my positive OPK on CD 13, one day later than usual for my Clomid cycles. Not quite sure why, but I'm sure it could just be natural variation. I called in to let them know we'd be in the next morning. Definitely feeling quite routine now! We dropped off the sample, headed out to breakfast, then stopped at a nearby store. I picked up some seeds for our vegetable garden in the spring. We start our seeds quite a long time before we plant the garden in May, so I shop early! At 10:30 AM, it was time to head back to the fertility center for the actual IUI. Thankfully it's only 15 minutes from our house. We're so lucky to have such a good office so close to us - I know so many people need to travel to get treatment. When we got into the exam room, the usual doctor came in. But a familiar nurse showed up as well! She was the nurse who did our IUI back in November, and we actually got pregnant! She remembered us and said she was so sad to hear about what had happened with the chemical pregnancy and the illness I had. I was really hoping it was a good sign she was there. Our washed sperm sample was 26.5 million with 59% motility. So this was our second best sample yet in terms of number of motile sperm. Really keeping our fingers crossed for this cycle! 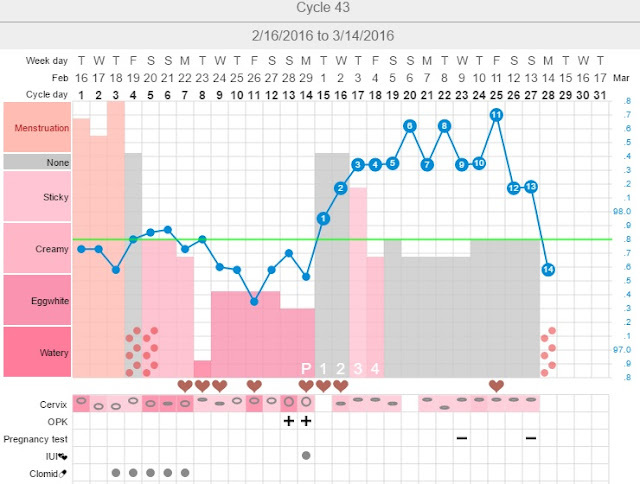 I had no symptoms or anything strange during the TWW, and I guess I should have figured that this was going to be another BFN cycle. AF arrived this morning, but I'm not too surprised. BFN's are the norm for me, so it's almost easier to just expect that! Still remaining hopeful that our next IUI will be the lucky one where we get out take home baby. I'm still waiting on a call back from my nurse for next cycle, because I have a lot of questions to ask this time about how to move forward if our last IUI doesn't work out. One of the things I've noticed with infertility, is that there comes a point when it becomes more difficult to be positive. 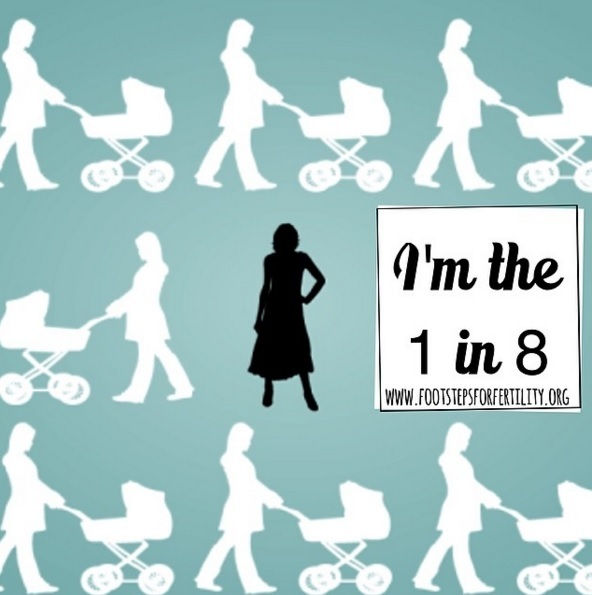 Infertility is full of disappointment and wanting something that is just out of your reach. But being positive does make you feel better. 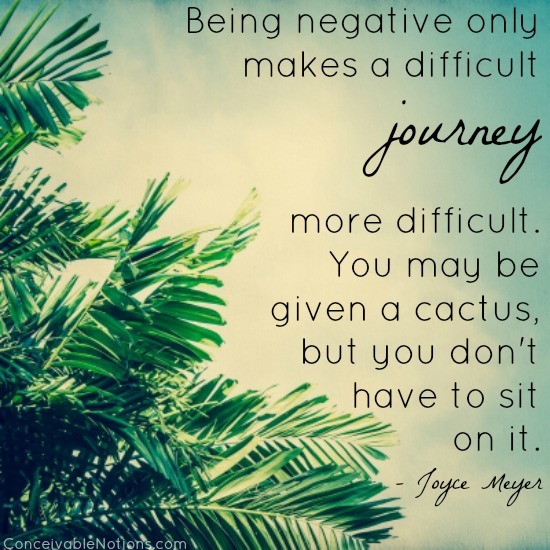 You can't let yourself get consumed by negativity! You also must not be to hard on yourself, because it is okay to be sad and angry sometimes. Trying to take my own advice and trying to be positive today!